This Indonesian volcano burns blue at night, but that’s not lava you’re seeing. Like a neon light show, the crater inside Kawah Ijen volcano in East Java, Indonesia, burns bright blue at night. But what’s creating the glow isn’t lava—it’s sulfur oxidizing. Vents called fumaroles belch out high-temperature gases, as well as fine particles of sulfur that oxidize upon exposure to air to form sulfur dioxide gas. The reaction generates blue flames that glow in the darkness, according to Vincent van Hinsberg, an assistant professor in the Department of Earth and Planetary Sciences at McGill University in Montreal. 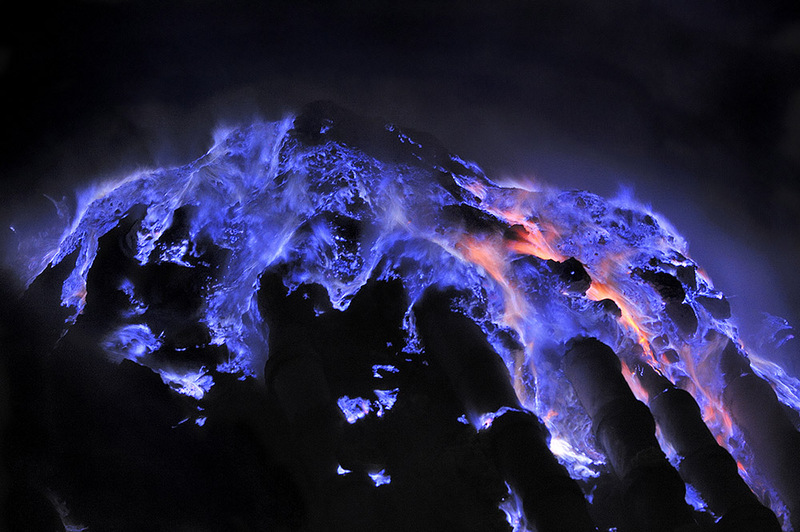 “These blue flames are indeed spectacular, as is Kawah Ijen in general!” he wrote in an email. The flames are visible during the daytime, too, but they appear red and much fainter. The last time the volcano fully erupted was in 1817. “[Kawah Ijen] is in a state of permanent de-gassing,” and therefore the likeliness of an explosive eruption is lower than for a volcano whose gases can’t escape freely, says Pierre Delmelle, a geochemistry professor at the Université catholique de Louvain in Belgium who studied the volcano in the 1990s. What makes Kawah Ijen truly unique is the hyper-acidic, turquoise lake found in its crater, says Delmelle. At about 3,000 feet in diameter and just over 600 feet deep, it’s the largest natural acidic crater lake in the world and is extremely toxic: Sulfur, chlorine, lead, arsenic, thallium, and other contaminants from subsurface magma seep through fumaroles in the lake bottom. Those toxins form bubbles that dissolve into the water to create various compounds, but mainly sulfuric acid. “It’s just insanely, insanely acidic,” adds van Hinsberg, who’s been studying the volcano for 15 years. Miners endure the toxic environment down by the lake in order to harvest sulfur from a system of pipes connected to fumaroles. The pipes siphon volcanic gases, which condense into molten sulfur as they course through the system. After emerging from the pipes, the scalding sulfur eventually solidifies, ripe for mining. Olivier Grunewald, an award-winning photographer who took the image of the blue flames above, has made multiple excursions to Kawah Ijen and experienced what the miners face daily. “During my first trip, I lost a camera and two lenses that [had] been corroded by acid,” he wrote in an email. While Grunewald wears a gas mask and other protective gear to capture images in the crater, the miners usually only use wet cloths to protect their mouths and noses while working. They break up the crystallized sulfur and then carry loads upwards of 200 pounds out of the crater, typically for meager wages, he says. “The sulfur, among the purest in Indonesia, is destined for the food and chemical industry,” according to Grunewald, who recently completed a documentary with Regis Etienne, the president of the Society of Volcanology of Geneva, about Kawah Ijen and the sulfur miners. Why Is This Fish Glowing Green? Researchers have discovered an unprecedented diversity of glowing fish species.